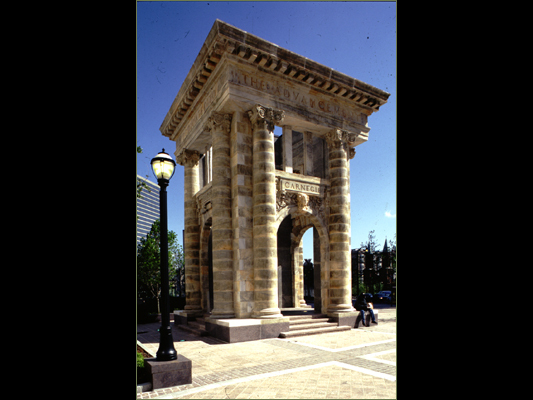 Out of 111 international entries representing 13 countries, Nimrod Long and Associates was awarded first place for the Peachtree Street/Auburn Avenue International Design Competition in 1991. The street and sidewalk improvements encompass 4.5 miles of Peachtree Street linking Atlanta’s downtown and Midtown. The design solution promotes mixed-use design principles such as residential housing, street level retail, sidewalk cafes and additional city parks to enhance the livability of the street. The plan emphasizes Peachtree’s role as Atlanta’s major urban spine. It links existing business districts with proposed residential and entertainment centers. Disparate land uses are bound together through a continuous pedestrian zone defined by similar pavements, street trees, light standards, and banners. A public art program of site-specific works interprets local history and culture. The plan strengthens existing business districts and promotes an infill mix of service retail, entertainment, and residential uses.